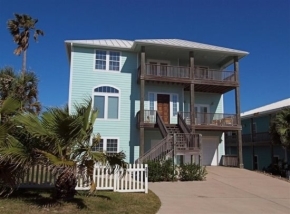 Discover this beautiful beachfront vacation home in Port Aransas on Mustang Island and the scenic views and unforgettable sunrises from the 2nd and 3rd story decks. A beautiful signature golf course in Port Aransas designed by Arnold Palmer, surrounded by an Audubon International Certified Bird Sanctuary, and your very own vacation home in the center of everything in Port Aransas located on Mustang Island! This is a great golf vacation! Port Aransas has our very own Arnold Palmer signature golf course with world class golf experiences unique to Texas. Located just down the beach from “Old Town” Port Aransas, golfers enjoy the warm sunny days and breezy nights at Palmilla Beach. Palmer designed this course (formerly Newport Dunes) as an 18-hole championship links course that was carved into the native sand dunes of this barrier island. Rolling fairways, immaculate greens and the very best customer service in the golf industry make Palmilla a destination golf course with many extra activities for the golfers family. Golfers are challenged by fairways lined with native grasses and foliage, and championship caliber greens. The golf course design and layout come together with the natural elements of this barrier island to create a new and exciting golf experience each time you play the course. Enjoy the full service club house with The Black Marlin Grill for indoor or outdoor dining. Enjoy a cocktail in the elevated bar area with million dollar views. Golfing, Fishing, Playing on the Beaches, and Schlitterbahn! 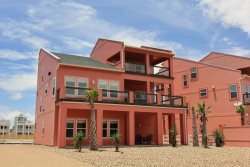 Port Aranas has plenty to keep the entire family having fun on your next vacation, and the rental home you select will be centrally located for unique shopping and dining experiences, beach exploration, fishing and Schlitterbahn! Schlitterbahn is our latest attraction as a world-class water park.